VW brand chief Diess expects a major acceleration in vehicle development. He is pictured in front of the BUDD-e concept at the Consumer Electronics Show. MUNICH -- Volkswagen has reorganized vehicle development at its core VW brand as the automaker strives to boost profitability and adapt more quickly to market trends. The change bundles development into four groups covering VW's small, compact, midsize and battery-powered cars. The responsibility for technology, quality, cost and deadline compliance, along with cost-effectiveness, now lies in one hand for the first time, VW said in a statement on Wednesday. Until now, these responsibilities were distributed across different divisions and different individual models groups, the company said. "We have to ensure that the corporate responsibility for each vehicle project is clearly assigned," VW brand CEO Herbert Diess said in the statement. "We expect these changes to bring about a major acceleration in [vehicle] development," he said. Small cars: Models including the Polo subcompact and Up minicar, along with future small SUVs will be the responsibility of Klaus-Gerhard Wolpert, 59, who has led product management at VW since 2010. Compact cars: Models such as the Golf, Europe's best-selling car, and compact SUVs will be led by Karlheinz Hell, 52, who has been VW's group purchasing manager for electrics/electronics since 2014. Mid and full-size cars: Vehicles including the Passat midsize sedan, Sharan large minivan, Touareg large SUV and an upcoming midsize SUV will be the responsibility of Elmar-Marius Licharz, 45, who has led VW brand's product controlling since 2010. 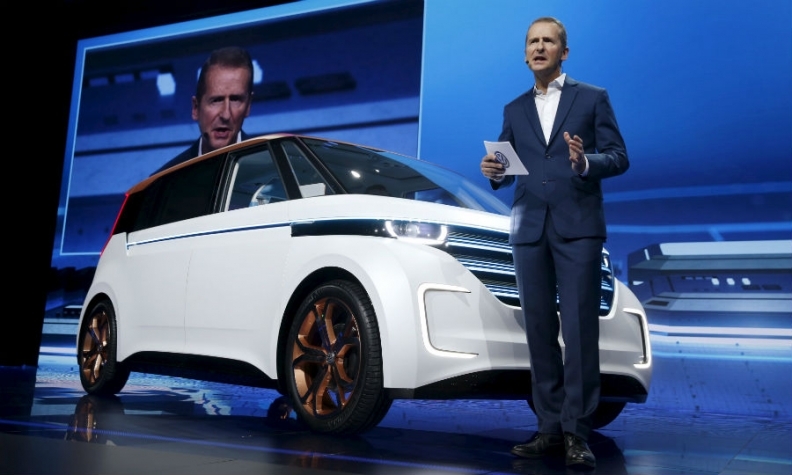 EVs: Battery cars including the electric Up and electric Golf, as well as future EVs and a possible production version of BUDD-e concept unveiled earlier this month at the Consumer Electronics Sow in Las Vegas will be headed by Christian Senger, 41. VW hired Senger from Continental where he was in charge of the supplier's automotive systems and technology division. Diess plans to cut investments at the VW brand by 1 billion euros ($1.1 billion) a year compared with previous targets and speed up efforts to increase cost savings as VW Group faces multi-billion euros of costs from its emissions-cheating scandal.